Mr. Joseph is a medical student, Department of Radiology and Biomedical Imaging, University of California, San Francisco, San Francisco, CA; Dr. Naeger is a Fellow, Department of Radiology and Biomedical Imaging, University of California, San Francisco, San Francisco, CA; and Dr. Qayyum is Professor of Radiology, Residency Program Director, Department of Radiology and Biomedical Imaging, University of California, San Francisco, San Francisco, CA. Cryptogenic cirrhosis, cirrhosis without a known underlying cause, is the third most common diagnosis in liver transplant recipients. quantification of liver fat.38 Proton (1H) MR spectroscopy (MRS) (Figure 4) has been found to correlate with hepatic lipid content. Estimates of the correlation coefficient between MRS measurements and histologic fat measurements range from 0.91 to 0.98.39-41 This technique is considered sensitive to small variation (≤0.5% change) in hepatic lipid content and has the potential to assess for small changes in steatosis due to treatment.41 However, a small sampling area can result in inaccurate assessment of the overall amount of fatty change due to the heterogeneous distribution of fat. Liver steatosis has been shown to be clearly linked to obesity. Clinically, BMI has often been used as a surrogate anthropometric marker of obesity-related morbidity. 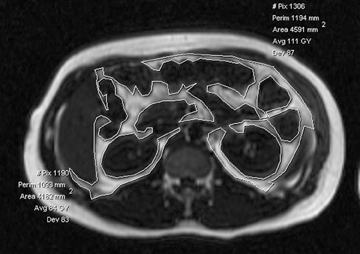 This measurement does not account for body tissue composition or distribution of body fat.42-44 The highly metabolically active visceral fat has been shown to correlate more closely with liver steatosis than BMI.45-51 MRI-derived estimates of visceral fat have proven more accurate than the anthropometric indices, including the waist-to-hip ratio (Figure 5).31 A variety of MR techniques have been employed for visceral fat estimation, with most using select slices to extrapolate to the rest of the body.47-50 The single slice method can be inaccurate due to the significant extrapolation required.49 A study by Brennan, et al., attempted to reduce this inaccuracy by dividing the body into 3-dimensional voxels of 2.02 2 2.02 2 8.00 mm3, and subsequently employing computer-assisted diagnostic techniques to provide a definite distribution of fat deposition.52 Visceral and subcutanaeous adisposity may also be estimated using unenhanced CT with the measurement of tissue areas demonstrating fat attenuation (Figure 6). Staggering obesity rates, failure of traditional weight-loss methods, and evidence-based effectiveness have placed bariatric surgery in the forefront of morbid obesity treatment.57-59 Radiology plays an important role in the evaluation of the post operative bariatric patient. Roux-en-Y is the most common bariatric procedure. The surgical protocol entails the creation of a gastric pouch separated completely from the remainder of the stomach, which is called the remnant. The jejunum is separated 30 cm to 40 cm distal from the ligament of Treitz and mobilized from the mesentery to form a gastrojejunostomy with side-to-side anastomosis. The anastomosed jejunal loop, called the Roux limb, is placed retrocolic through an aperture formed in, or in front of, the transverse mesocolon. Finally, a jejunojejunostomy is created 100 cm to 150 cm distal from the original gastrojejunostomy.60 The post operative day 1 assessment protocol includes an initial gastrograffin fluoroscopic imaging study to evaluate for anastomotic leak. If a nasogastric tube is present, often after an open Roux-en-Y gastric bypass, the tube must be pulled back as to not obscure leakage from the anastomosis.61 Rarely, leaked contrast entering the lumen of a surgical drain may be the only fluoroscopic evidence of leak and must not be overlooked. 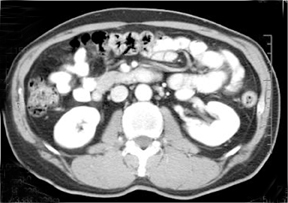 CT can be a useful adjunct modality, capable of demonstrating leaked contrast, as well as intra-abdominal collections and abscesses. 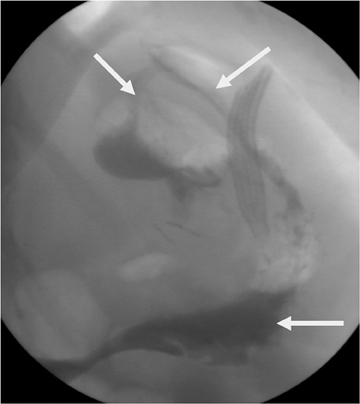 In 5% of patients, obstruction occurs as a complication at the gastrojejunostomy site, mesocolic window, and behind the Roux limb(Peterson’s space).61-63 Anastomotic stricture at the gastrojejunal anastomosis is seen on fluoroscopy as narrowing at the gastrojejunalanastomosis, with expansion of the gastric pouch and delayed transit of contrast into the Roux limb.60 Mesocolic window stenosis is a potential cause of obstruction in patients with retrocolic placement of the Roux limb and is seen fluoroscopically as distention of the Roux limb proximal to the location of the mesocolic window. The size of obese and bariatric patients imposes certain limitations for imaging. CT and fluoroscopy table weight limits, often 450 to 500 lbs, and a gantry opening of 70 cm can preclude imaging certain patients. Dropping the CT table can potentially accommodate larger patients. The larger body habitus of bariatric patients can also degrade image quality. The use of conventional, rather than spiral scanning, techniques and increased mAs can improve quality imaging through increases in radiation. Upper airway obstruction is an inherent risk of positioning obese patients in the supine position. The imaging team should be prepared for this possible complication and may consider having the lift team readily available. Increasing incidence of obesity and NAFLD underscores the necessity of diagnosing fatty liver before progressing to advanced disease states. 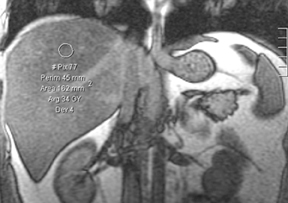 Imaging is an efficient and safe alternative to liver biopsy for estimating liver fat. Of the imaging options, MRI is considered the safest and most sensitive technique in detecting liver steatosis. MRI and CT may also be used to estimate visceral fat, which demonstrates a better correlation with liver steatosis than anthropometric measures. Imaging also plays a pivotal role in the postoperative evaluation of bariatric patients. Ludwig J, Viggiano TR, McGill DB, Oh BJ. Nonalcoholic steatohepatitis: Mayo Clinic experiences with a hitherto unnamed disease. Mayo Clin Proc. 1980;55:434-438. Schaffner F, Thaler H. Nonalcoholic fatty liver disease. Prog Liver Dis. 1986;8:283-298. U.S. Obesity trend: Trends by state. Centers for Disease Control and Prevention, National Center for Health Statistics. Available at: http://www.cdc.gov/obesity/data/trends. html. Accessed November 11, 2010. Brolin RE. Bariatric surgery and long-term control of morbid obesity. JAMA. 2002;288:2793-2796. Hedley AA, Ogden CL, Johnson CL, et al. Prevalence of overweight and obesity among US children, adolescents, and adults, 1999-2002. JAMA. 2004;291:2847-2850. Jimba S, Nakagami T, Takahashi M, et al. Prevalence of non-alcoholic fatty liver disease and its association with impaired glucose metabolism in Japanese adults. Diabet Med. 2005;22:1141-1145. Marchesini G, Brizi M, Morselli-Labate AM, et al. Association of nonalcoholic fatty liver disease with insulin resistance. Am J Med. 1999;107:450-455. Sanyal AJ, Campbell-Sargent C, Mirshahi F, et al. Nonalcoholic steatohepatitis: Association of insulin resistance and mitochondrial abnormalities. Gastroenterology. 2001;120:1183-1192. Bacon BR, Farahvash MJ, Janney CG, Neuschwander-Tetri BA. Nonalcoholic steatohepatitis: An expanded clinical entity. Gastroenterology. 1994;107:1103-1109. Sanyal AJ, American Gastroenterological Association. AGA technical review on nonalcoholic fatty liver disease. Gastroenterology. 2002;123:1705-1725. Powell EE, Cooksley WGE, Hanson R, et al. The natural history of nonalcoholic steatohepatitis: A follow-up study of forty-two patients for up to 21 years. Hepatology. 1990;11:74-80. Bugianesi E, Leone N, Vanni E, et al. Expanding the natural history of nonalcoholic steatohepatitis from cryptogenic cirrhosis to hepatocellular carcinoma. Gastroenterology. 2002;123:134-140. Neuschwander-Tetri BA, Caldwell SH. Nonalcoholic steatohepatitis: Summary of an AASLD single topic conference. Hepatology. 2003;37:1202-1219. Contos MJ, Cales W, Sterling RK, et al. Development of nonalcoholic fatty liver disease after orthotopic liver transplantation for cryptogenic cirrhosis. Liver Transpl. 2001;7:363-373. Caldwell SH, Oelsner DH, Iezzoni JC, et al. Cryptogenic cirrhosis: Clinical characterization and risk factors for underlying disease. Hepatology. 1999;29:664-669. Poonawala A, Nair SP, Thuluvath PJ. Prevalence of obesity and diabetes in patients with cryptogenic cirrhosis: A case-control study. Hepatology. 2000;32:689-692. Sakugawa H, Nakasone H, Nakayoshi T, et al. 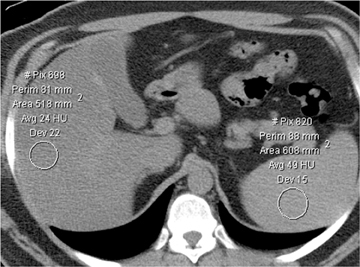 Clinical characteristics of patients with cryptogenic liver cirrhosis in Okinawa, Japan. Hepatogastroenterology. 2003;50:2005-2008. Ong J, Younossi ZM, Reddy V, et al. Cryptogenic cirrhosis and posttransplantation nonalcoholic fatty liver disease. Liver Transpl. 2001;7:797-801. Sheela H, Seela S, Caldwell C, et al. Liver biopsy: Evolving role in the new millennium. J Clin Gastroenterol. 2005,39:603-610. Mehta SR, Thomas EL, Bell JD, et al. Non-invasive means of measuring hepatic fat content. World J Gastroenterol. 2008;14:3476-3483. Ratziu V, Charlotte F, Heurtier A, et al. Sampling variability of liver biopsy in nonalcoholic fatty liver disease. Gastroenterology. 2005;128:1898-1906. Graif M, Yanuka M, Baraz M, et al. Quantitative estimation of attenuation in ultrasound video images: Correlation with histology in diffuse liver disease. Invest Radiol. 2000;35:319-324. Saadeh S, Younossi ZM, Remer EM, et al. The utility of radiological imaging in nonalcoholic fatty liver disease. Gastroenterology. 2002;123:745-750. Lall CG, Aisen AM, Bansal N, et al. Nonalcoholic fatty liver disease. AJR Am J Roentgenol. 2008;190:993-1002. Joseph AE, Saverymuttu SH, al-Sam S, et al. Comparison of liver histology with ultrasonography in assessing diffuse parenchymal liver disease. Clin Radiol. 1991;43:26-31. Needleman L, Kurtz AB, Rifkin MD, et al. 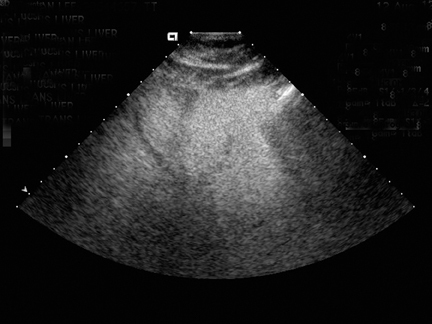 Sonography of diffuse benign liver disease: Accuracy of pattern recognition and grading. AJR Am J Roentgenol. 1986;146:10111015. Saverymuttu SH, Joseph AE, Maxwell JD. Ultrasound scanning in the detection of hepatic fibrosis and steatosis. Br Med J. 1986;292:13-15. Davidson LE, Kuk JL, Church TS, Ross R. Protocol for measurement of liver fat by computed tomography. J Appl Physiol. 2006;100:864-868. Siegelman ES, Rosen MA. Imaging of hepatic steatosis. Semin Liver Dis. 2001;21:71-80. Bahl M, Qayyum A, Westphalen AC, et al. Liver steatosis: Investigation of opposed-phase T1-weighted liver MR signal intensity loss and visceral fat measurement as biomarkers. Radiology. 2008;249:160-166. Levenson H, Greensite F, Hoefs J, et al. Fatty infiltration of the liver: Quantification with phase-contrast MR imaging at 1.5 T vs biopsy. AJR Am J Roentgenol. 1991;156:307-312. Fishbein MH, Gardner KG, Potter CJ, et al. Introduction of fast MR imaging in the assessment of hepatic steatosis. Magn Reson Imaging. 1997;15:287-293. Promrat K, Lutchman G, Uwaifo GI, et al. A pilot study of pioglitazone treatment for nonalcoholic steatohepatitis. Hepatology. 2004;39:188-196. Kreft BP, Tanimoto A, Baba Y, et al. Diagnosis of fatty liver with MR imaging. J Magn Reson Imaging. 1992;2:463-471. Qayyum A, Goh JS, Kakar S, et al. Accuracy of liver fat quantification at MR imaging: Comparison of out-of-phase gradient-echo and fat-saturated fast spin-echo techniques—initial experience. Radiology. 2005;237:507-511. Westphalen AC, Qayyum A, Yeh BM, et al. Liver fat: Effect of hepatic iron deposition on evaluation with opposed-phase MR imaging. Radiology. 2007;242:450-455. Hines CD, Yu H, Shimakawa A, McKenzie CA, et al. T1 independent, T2* corrected MRI with accurate spectral modeling for quantification of fat: Validation in a fat-water-SPIO phantom. J Magn Reson Imaging. 2009;30:1215-1222. Bley TA, Wieben O, Francois CJ, et al. Fat and water magnetic resonance imaging. J Magn Reson Imaging. 2010;31:4-18. Machann J, Thamer C, Schnoedt B, et al. Hepatic lipid accumulation in healthy subjects: A comparative study using spectral fat-selective MRI and volume-localized 1H-MR spectroscopy. J Magn Reson Med. 2006;55:913-917. Longo R, Pollesello P, Ricci C, et al. Proton MR spectroscopy in quantitative in vivo determination of fat content in human liver steatosis. J Magn Reson Imaging. 1995;5:281-285. Thomsen C, Becker U, Winkler K, et al. Quantification of liver fat using magnetic resonance spectroscopy. Magn Reson Imaging. 1994;12:487-495. Ramesh S, Sanyal AJ. Hepatitis C and nonalcoholic fatty liver disease. Semin Liver Dis. 2004;24:399-413. Luyckx FH, Desaive C, Thiry A, et al. Liver abnormalities in severely obese subjects: Effect of drastic weight loss after gastroplasty. Int J Obes Relat Metab Disord. 1998;22:222-226. Bonora E. Relationship between regional fat distribution and insulin resistance. Int J Obes Relat Metab Disord. 2000;24:S32-S35. Kral JG, Schaffner F, Pierson RN Jr, Wang J. Body fat topography as an independent predictor of fatty liver. Metabolism. 1993;42:548-551. Asayama K, Hayashibe H, Dobashi K, et al. Relationships between biochemical abnormalities and anthropometric indices of overweight, adiposity, and body fat distribution in Japanese elementary school children. Int J Obes Relat Metab Disord. 1995;19:253-259. Omagari K, Kadokawa Y, Masuda J, et al. Fatty liver in non-alcoholic non-overweight Japanese adults: Incidence and clinical characteristics. J Gastroenterol Hepatol. 2002;17:1098-1105. Ruhl CE, Everhart JE. Determinants of the association of overweight with elevated serum alanine aminotransferase activity in the United States. Gastroenterology. 2003;124:71-79. Eguchi Y, Eguchi T, Mizuta T, et al. Visceral fat accumulation and insulin resistance are important factors in nonalcoholic fatty liver disease. J Gastroenterol. 2006;41:462-469. Marceau P, Biron S, Hould FS, et al. Liver pathology and the metabolic syndrome X in severe obesity. J Clin Endocrinol Metab. 1999;84:1513-1517. Sabir N, Sermez Y, Kazil S, Zencir M. Correlation of abdominal fat accumulation and liver steatosis: Importance of ultrasonographic and anthropometric measurements. Eur J Ultrasound. 2001;14:121-128. Brennan DD, Whelan PF, Robinson K, et al. Rapid automated measurement of body fat distribution from whole-body MRI. AJR Am J Roentgenol. 2005;185:418-423. Pietrobelli A, Formica C, Wang Z, Heymsfield SB. Dual-energy X-ray absorptiometry body composition model: Review of physical concepts. Am J Physiol. 1996;271:941-951. Bachrach LK. Dual energy X-ray absorptiometry (DEXA) measurements of bone density and body composition: Promise and pitfalls. J Pediatr Endocrinol Metab. 2000;13:983-988. Mattsson S, Thomas BJ. Development of methods for body composition studies. Phys Med Biol. 2006;51:203-228. Kullberg J, Brandberg J, Angelhed JE, et al. Whole-body adipose tissue analysis: Comparison of MRI, CT and dual energy X-ray absorptiometry. Br J Radiol. 2009;82:123-130. Livingston EH. Obesity and its surgical management. Am J Surg. 2002;184:103-113. Puzziferri N, Austrheim-Smith IT, Wolfe BM, et al. Three-year follow-up of a prospective randomized trial comparing laparoscopic versus open gastric bypass. Ann Surg. 2006;243:181-188. Ali MR, Fuller WD, Choi MP, Wolfe BM. Bariatric surgical outcomes. Surg Clin North Am. 2005;85:835-852. Chandler RC, Srinivas G, Chintapalli KN, et al. Imaging in bariatric surgery: A guide to postsurgical anatomy and common complications. AJR Am J Roentgenol. 2008;190:122-135. Merkle EM, Hallowell PT, Crouse C, et al. Roux-en-Y gastric bypass for clinically severe obesity: Appearance and spectrum of complications at imaging. Radiology. 2005;234:674-683. Blachar A, Federle MP. Gastrointestinal complications of laparoscopic Roux-en-Y gastric bypass surgery in patients who are morbidly obese: Findings on radiography and CT. AJR Am J Roentgenol. 2002;179:1437-1442. The story of surgery for obesity. American Society for Bariatric Surgery. Available at: http://www.asbs.org/html/story/chapter1.html. Accessed on November 11, 2010. Herron DM. The surgical management of severe obesity. Mt Sinai J Med. 2004;71:63-71. Pretolesi F, Camerini G, Bonifacino E, et al. 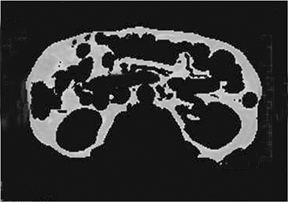 Radiology of adjustable silicone gastric banding for morbid obesity. Br J Radiol. 1998;71:717-722. Mehanna MJ, Birjawi G, Moukaddam HA, et al. 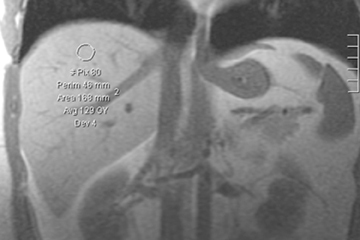 Complications of gastric banding: A radiological pictorial review. AJR Am J Roentgenol. 2006;186:522-534. Weiss H, Peer R, Nehoda H, et al. Improved scinti-graphic assessment of occult leakages in adjustable gastric bands using 99mTc-labelled human albumin colloid. Obes Surg. 2001;11:502-506. The obesity epidemic: The role of radiology. Appl Radiol.